Although the days are starting to get shorter and feel a bit cooler, there’s still plenty of time to break out the sunblock and margarita mix. Before you go packing your bags and jetting off to Ibiza, Santorini, or somewhere else along the Mediterranean Coast, check out the underdog of the European sun and surf club: England. Now, I know the type of images that pop up when one thinks of the U.K.; pea coats and Burberry scarves, Wellington rain boots and herds of sheep. A place where a day is considered warm if you don’t have to wear gloves and pleasant if it’s only misting, and not raining hard enough to require an umbrella. Believe it or not, the British Isles do see their fair share of hot weather. True, the thermometer most likely won’t break the 90F degree mark. However, with summer temperatures in southern England averaging around the mid to high 70s, you can hit the beach and leave your jackets and Wellies at home. Bonus: you won’t be so uncomfortably hot that you’re afraid to leave the shade of your umbrella. The best part? Many of these beaches are only a few hours from London, making them great day trips if you don’t have a lot of lounging time booked into your vacation. Ready to dive in? Located on the southwestern tip of England, Fistral Beach is widely known as the surfing capital of Britain, and hosts several major boarding competitions annually. Nearby Newquay is your typical seaside surf town, with a variety of quaint bed and breakfasts, tons of shops and cafes, sidewalks (and hostels) populated by long haired surfer dudes, and even a few Volkswagen vans driving around the scenic cliffside streets. Normally boasting about 22,000 residents, Newquay’s population swells to five times that in the summer. 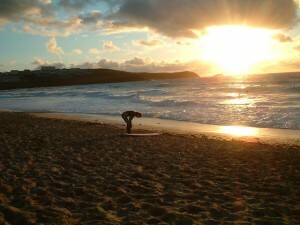 However, despite its proximity to a bustling town, Fistral Beach’s waters remain a light Caribbean blue. And, with about half a mile of sandy real estate to choose from (as well as seven other beaches nearby), you’ll never be fighting for a spot to place your towel. As for you surfers, if you’re experienced, try your hand at the Cribbar, a reef situated at the north end of the beach which can generate waves up to 40 feet. Those less steady on the board should stick to the southern end, which has thinner crowds and has gentler swells. For beginners, Newquay is home to over 18 different surf schools, so you can shop around a bit before hitting the waves. A downside to Fistral – it is a bit far from London and therefore not the easiest choice for a day trip. However, from the end of May until late September there are daily direct trains from the capital (the trip takes about 5 hours each way) with discounts available if you book in advance. For those of you with a larger budget, air travel is another option. Newquay is only an hour flight from London, but tickets will set you back at least £100. No money for a day trip? Don’t fret! Newquay’s legendary nightlife is fueled by a variety of after-hours establishments, from traditional English pubs to cliff-front cafes to all-night dance clubs popular with bachelor and bachelorette parties. 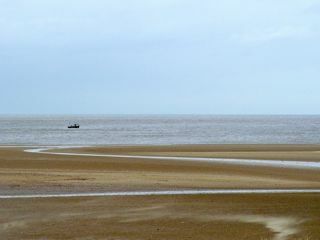 For those of you dreaming of a quieter day at the beach, try Holkham on England’s east coast. Named 2011’s Best British Beach by Coast Magazine, it’s where Gwyneth Paltrow took her solitary walk at the end of Shakespeare in Love and, allegedly, where the Queen likes to takes her dogs when she’s in the area. Located on the Holkham National Nature Reserve, Holkham Beach is long, quiet, secluded and – best of all – it appears untouched despite the thousands of visitors who visit its shores annually. Strict Reserve laws about pets, garbage, and barbecuing keep messiness to a minimum, so you won’t see any ice cream stands or beach chairs for rent here. Instead, you’ll find miles of sand alongside acres of peaceful pine trees. And, with a population of less than 300, Holkham Village makes for a perfect escape from the hustle and bustle of everyday life. About a mile inland, at the center of the nature preserve, sits Holkham Hall, a jack-of-all-trades museum/grocery store/cafe/gift shop. Conveniently, it is also where the Holkham Beach nature walk begins and ends. Holkham Beach is accessible by car, bus or train though train travel will require a cab or bicycle ride from the station to the beach. The trip by rail is approximately 90 minutes, while the drive is about 2.5 hours. During the summer months, buses and trains running to and from London depart almost hourly. However, if one day just isn’t enough for you, Holkham Village and Wells-Next-The-Sea have a selection of hotels and bed and breakfasts. You won’t get the same variety as Newquay, but you also won’t get the crowds. 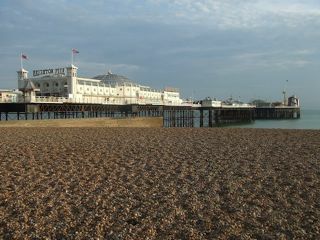 The city of Brighton on England’s southeast coast is arguably the most popular destination for U.K. summer holidays, and has been for more than 200 years. Here you’ll find all the perks of Atlantic City with better fried fish and absolutely no Jersey Shore types. Brighton Beach boasts miles of pebbled beaches, chairs, umbrellas and watercrafts available to rent, delicious beachfront cafes and restaurants and a pier filled with rides, games and two casinos. Unlike Newquay, where the town is a short walk from the beach, Brighton is literally beach – street – city, and is perfect for a day of swimming and shopping. Since the late 1700s, when Brighton’s waters became famous for their alleged restorative powers, U.K. residents and tourists have been flocking to its shores every summer. In Jane Austen’s Pride and Prejudice, it is where Lydia Bennett flees to after becoming enthralled with Mr. Wickham. Austen herself made several trips down over her lifetime. In fact, in 1796, she wrote from Brighton to her sister Cassandra, saying, “Here I am once more in this scene of dissipation and vice, and I begin already to find my morals corrupted.” Sounds fun, right? The Brighton of today is a colorful college town with a large portion of its population made up of students in their late teens to late 20s. It is also widely regarded as the gay capital of Britain. The drive from London to Brighton takes about an hour, while some express trains can get you there as fast as 20 minutes. From the train or bus station, it is just a short walk to the shore, making this party town ideal for a day at the beach or a night at any of its popular seafront clubs. Beach lovers who like a little folklore with your sea breeze should try out Tintagel, a small, legend-rich town just up the road from Newquay with a population of less than 2,000. Though it does get warm summers, Tintagel isn’t the most popular place to bring your lounge chair and tanning oil. You’ll find more sightseers than sunbathers on these stretches of sand. Tintagel’s six beaches are home to a string of breathtaking cliffs with great nature walks. And, in fact, many of its seafronts are only accessible by footpath, which keep them from getting overly crowded in the summer months. Another popular characteristic of Tintagel’s beaches are rock pools, which can double as shallow paddling areas for kids during low tide. Want to stay seaside without getting wet? Take a walk up to Tintagel Castle, the alleged birthplace of King Arthur. Dating back to Roman times, the castle today is a majestic cliffside ruin, as well as home to some of the area’s best views. 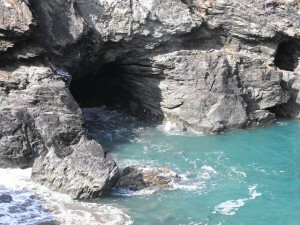 Just down from the castle, on Tintagel Beach, you’ll find Merlin’s Cave, the supposed seafront home of the legendary wizard. The beach and cave are both a bit difficult to get to, as you have to climb down the rocks, but are definitely worth the visit. However, make sure to keep track of the tides, as the cave floods when the sea rises. Tintagel, like Newquay, is a bit far from London. And, since it is not a major tourist attraction, you will most likely have to take a car or bus, as the nearest train station is about 16 miles away. Looking for some seafront sightseeing? Then Dover Beach in the southeast is the place for you! Here you’ll find the famous White Cliffs of Dover, one of England’s most famous natural attractions, and a must-see for any trip to the U.K. When visiting Dover, you can view the cliffs from above, while taking one of the area’s many nature walks, or from below, while lounging on its scenic pebble beach. Nearby you’ll also find the famous Dover Castle, still standing after nearly a millennium of use. This fortification doesn’t just command a great view of the seafront, it also contains a network of secret tunnels through the cliffs that were used as recently as World War II and are now open to visitors. Direct trains from London run frequently and will get you cliffside in just over an hour. Buses are also available, but the ride is slightly longer. 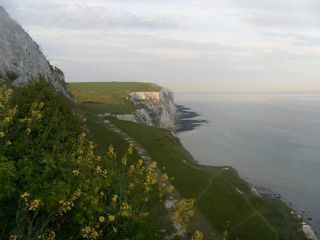 Besides its White Cliffs, Dover is also known for being the closest part of England to continental Europe. In fact, the annual swimming race across the English Channel leaves from one of Dover’s beaches. On a clear day, you can see the coast of Calais, France, which also happens to be Dover’s sister city, just over 20 miles away. And, if you’re feeling particularly adventurous, the ferry from Dover Harbor can get you on French soil in about 90 minutes. So there you have it, five unexpectedly great British beach destinations. Whether you’re looking for a quiet shore day or a seaside surf party, factual history or supernatural legends, there’s something for everyone along the English coast. Cindy Klimek is a Brooklyn, New York native and recent graduate of the University of Sussex in Brighton, England. She aspires to become a multilingual travel writer/jetsetter. Lovely beach selection. Brighton’s not the best for its actual ‘beachy-ness’ but it’s a great weekend trip from London: Lots of quirky things to do and see. The beach is best for people watching, and the pebbles are pretty comfortable. And of course, you won’t get sand stuck *everywhere*. Good overview there. Newquay is a great choice as is Brighton, possibly not for the beach itself but everything else that comes with it. I would say that possibly Wales should get a mention too with it being best beaches in Britain. There are some lovely seaside towns such as Aberystwyth and Harlech has a lovely beach too. I’ve been surfing online greater than 3 hours as of late, but I by no means discovered any fascinating article like yours. It is lovely price sufficient for me. In my opinion, if all site owners and bloggers made good content as you probably did, the web might be much more useful than ever before.